Mike Fox, a former employee with Walker Transport passes along news he was one of 20 local drivers terminated by MacKinnon Transport out of Guelph, Ont., which acquired Walker Transport in St. Thomas this past fall. At the time, although Julie Tanguay of Walker was coy about the matter, we wrote the move would result in cuts to the local operation, if not the entire withdrawal of operations in St. Thomas. Little did we anticipate MacKinnon would pull the plug on these employees one week prior to Christmas. Read Mike’s comment and the full story here and a further backgrounder, including an interview with MacKinnon President and CEO Evan MacKinnon can be found here . At that time he told the Times-Journal of the 140 or so employees at Walker, all 100 drivers have already been offered jobs while they’re hoping to hire 20 mechanics, dispatchers and other staff at the company’s headquarters in Guelph. “We’re remaining optimistic that we can fill those roles with people from St. Thomas,” assured MacKinnon. Despite claims from company president Julie Tanguay last week in the Times-Journal, the merger of L.E. 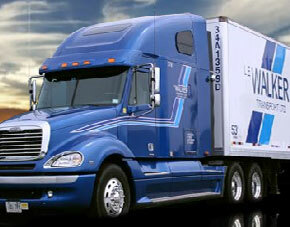 Walker Transport with MacKinnon Transport of Guelph, Ont., is not good news for the city. In fact it means the loss of some jobs and the shutting down of the St. Thomas terminal, likely by the end of the year. Here is the updated story with MacKinnon president Evan MacKinnon from the T-J. St. Thomas-based Walker Group, which includes well-known L.E Walker Transport Ltd., will close despite reports last week that the facility would remain in town after the 60-year-old company was acquired by MacKinnon Transport of Guelph, Ont. But until the company sells the facility in St. Thomas, local drivers will be able to use the drop yard at the South Edgeware Road site, says the company’s president. Friday, the Guelph Mercury reported that MacKinnon’s acquisition of Walker Group — which includes L.E. Walker and Mid America Freight Systems — means the St. Thomas site would close, bringing 120 jobs to Guelph. President and CEO Evan MacKinnon confirmed that statement. In an interview last week, Julie Tanguay, Walker Group president and soon-to-be executive vice-president of sales for MacKinnon said there wouldn’t be any job losses. MacKinnon said it’s true that it will be business as usual for now — he expects the company to be relocated before the end of 2009, meaning local office facilities will be shuttered. Of the 140 or so employees at Walker, all 100 drivers have already been offered jobs while they’re hoping to hire 20 mechanics, dispatchers and other staff at the company’s headquarters in Guelph. As for drivers, MacKinnon noted they’ll be establishing a drop yard in the London area, but since the St. Thomas facility is a fair distance away from Highway 401, it may not be used for this role. When MacKinnon officially assumes ownership of the South Edgeware Road site, the plan is to sell it. When all is said and done, MacKinnon Transport will employ 420 people and operate 340 trucks. The intention is to close the Walker Group’s trucking terminal in St. Thomas and relocate those operations to MacKinnon Transport, which is headquartered on Laird Road in Guelph. MacKinnon said Guelph operations, which will continue as MacKinnon Transport, can accommodate most Walker staff, with the anticipated loss of about 20 employees in St. Thomas. But that means 120 more jobs in Guelph, he stressed. GUELPH, Ont. — Two of Canada’s most prominent family-owned for-hire carriers have merged. Evan MacKinnon, president and CEO of MacKinnon Transport in Guelph, Ont. announced that his company has acquired St. Thomas, Ont.-based LE Walker Transport and its subsidiary MidAmerican Freight Systems. Both southern Ontario carriers are major players in the cross-border dry van and flatbed markets. Walker also has a growing number of tankers and container chassis and its inroads in the intermodal sector will likely complement MacKinnon’s own intermodal transport business as well.